In 2009, stop-motion animated movie Coraline came out in analog 3D on Blu-ray , the old kind that needs the red/blue glasses, but on Jan. 4, 2011, Universal Studios Home Entertainment released the family film in the new stereoscopic Blu-ray 3D, the same technology that’s used in theaters. The 2009 movie, based on the graphic novel by Neil Gaiman , was filmed in 3D. It features the voice of Dakota Fanning as the titular girl, who moves into a house with her parents only to discover another, sinister world hidden behind a secret door. The film also has the voices of Desperate Housewives‘ Teri Hatcher, Absolutely Fabulous‘ Jennifer Saunders and Dawn French, Keith David (Lottery Ticket) and Ian McShane (The Pillars of the Earth). The PG-rated Coraline was written and directed by Henry Selick, director for the similarly filmed The Nightmare Before Christmas. 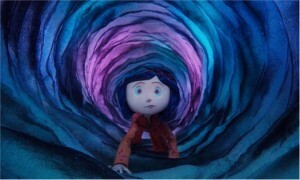 Nominated for the best animated movie Academy Award, Coraline grossed $75 million when it was in theaters. The Blu-ray 3D release is a two-disc set containing the movie in both stereoscopic 3D and high-definition 2D, plus a downloadable digital copy of the 2D version. Selick’s commentary with composer Bruno Coulais, which has been included on earlier home entertainment editions of Coraline, is on this release, as well as a featurette about how the filmmakers created the handmade world of the film.